Q. 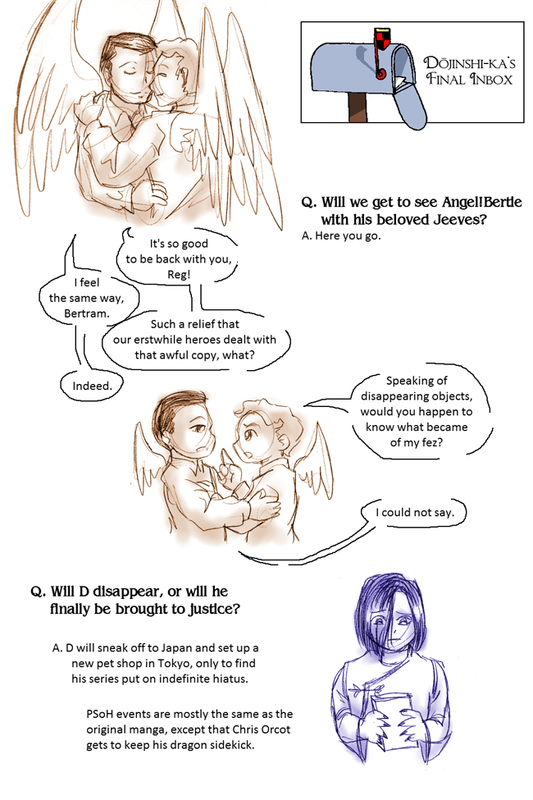 Will we get to see angel!Bertie with his beloved Jeeves? Bertie: It’s so good to be back with you, Reg! Jeeves: I feel the same way, Bertram. Bertie: Such a relief that our erstwhile heroes dealt with that awful copy, what? Bertie: Speaking of disappearing objects, would you happen to know what became of my fez? Jeeves: I could not say. Q. Will D disappear, or will he finally be brought to justice? A. D will sneak off to Japan and set up a new pet shop in Tokyo, only to find his series put on indefinite hiatus. PSoH events are mostly the same as the original manga, except that Chris Orcot gets to keep his dragon sidekick.